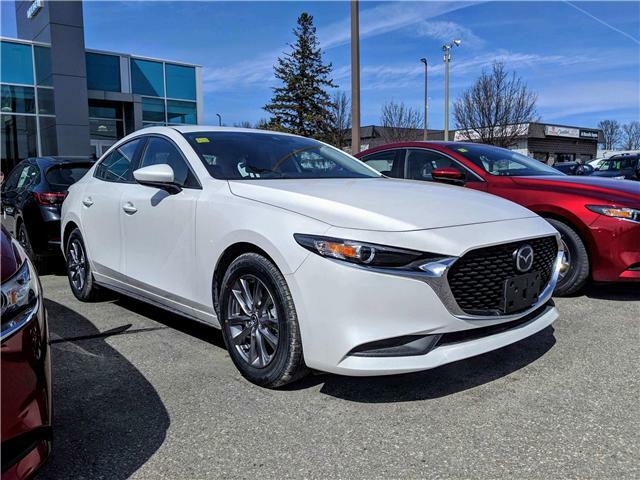 This Snowflake White maunal transmission 2019 Mazda3 is the embodiment of the tireless work of master craftsmen, focused on creating a human-centric vehicle that makes feel alive whenever you are behind the wheel. Equipped with Mazda's SKYACTIV suite of technologies this Mazda3 delivers an engaging, spirited drive while maintaining amazing fuel economy ratings. It comes G-Vectoring Control Plus an improved version of our AJAC Innovation Award G-Vectoring Control technology which improves handling by imperceptibly reducing torque when entering a turn to shift the weight of the vehicle forward and improve handling when turning. The Mazda Connect infotainment software has a new, streamlined design on an 8.8" wide colour display. This coupled with standard Apple CarPlay and Android Auto means you can remain connected with your world while behind the wheel of this amazing vehicle. This 2019 Mazda3 GS comes well-equipped with a range of safety and quality of life technologies to give you confident and comfortable ride. These include Advanced Blindspot Monitoring (ABSM) Mazda Radar Cruise Control (MRCC) with Stop and Go functionality, Smart City Brake Support (SCBS), Pedestrian Detection, a Lane-keep Assist System (LAS) as well as heated front seats and a leather wrapped, heated steering wheel to keep you warm during our cold Canadian Winters. Since it was introduced in 2004 the Mazda3 has gone on to win more awards than any other vehicle made by any manufacturer, and with this 2019 Mazda3, this great vehicle just got better. This Mazda is covered by Mazda Unlimited, Canada's First Unlimited Mileage Warranty. This warranty has unlimited kilometers, allowing you to focus on enjoying the drive, no matter how far the destination. * Every reasonable effort is made to ensure the accuracy of the information listed above. Vehicle pricing, incentives, options (including standard equipment), and technical specifications listed is for the 2019 Mazda Mazda3 may not match the exact vehicle displayed. Please confirm with a sales representative the accuracy of this information.